No one creates realms like New York Times bestselling author Anne Bishop. Now in a thrilling new fantasy series, enter a world inhabited by the Others, unearthly entities—vampires and shape-shifters among them—who rule the Earth and whose prey are humans.As a cassandra sangue, or blood prophet, Meg Corbyn can see the future when her skin is cut—a gift that feels more like a curse. Meg’s Controller keeps her enslaved so he can have full access to her visions. But when she escapes, the only safe place Meg can hide is at the Lakeside Courtyard—a business district operated by the Others. In a world very different than our own, where monsters known as the terra indigene, or Others rule, one woman seeks to change her fate. Meg Corbyn has the ability to see the future whenever her skin is broken, but once a spot it scarred it can never be used again. At least not without severe pain and consequences. All her life, she's been kept in captivity, kept ignorant by people who use her visions for profit. But they made a mistake when they double cut her skin to punish her for disobedience, as the vision she saw gave her the tools she needed to escape. The only safe place to go, is where human law doesn't apply, the Courtyard occupied by the Others. But she may have just jumped from the frying pan to the fire as the Others are more dangerous than she ever could have imagined. Most of the terra indigene didn't want to love humans; they wanted to eat them. Why did humans have such a hard time understanding that? Don't get me wrong, this isn't one of those horror books where the monsters are mindless beasts, living only for the kill. They just really aren't human, and no amount of wishful romanticizing on any human's part will change that. I mean humans "smelling like prey" played a huge part in this book. This may sound funny coming from a romance fan such as myself, but I really loved seeing the monsters without the romantic labels being shoved on them that has been so prevalent in the genre. It always seems like the monsters in urban fantasy are either completely incapable of rational thought and only induce terror, or they become almost diminished as they fall for a human. There was just something completely "other" about the terra indigene and it made for a very refreshing change of pace. I absolutely adored Meg's character. She is the shining innocence and softness to the harsh reality that is the terra indigene. There's just something so childlike, yet strong that draws the rest of them in despite their gut reaction to want to rend humans. She was able to get away with things that no other human could have. Of course she isn't really quite human either, but she's not a monster either, so her standing up to them really endeared her to me. In turn, all of the Others in the courtyard turned their own antics up just to get a rise out of her, which was rather amusing. But more importantly, they also quickly formed a fierce protectiveness of her that was really surprising. It's like they were all momma bears and she was their cub, and they would rend anyone who even thought to look at her crosseyed. Of course they didn't really need any excuse to rend normally, but it still was endearing that they were so protective of her. I really enjoyed seeing that dynamic grow between her and the Others, but there was one dynamic that really stuck out to me. Now this may sound odd considering the fact that in the previous paragraph I had praised the fact that WRITTEN IN RED'S monsters weren't romanticized, but I did also notice the potential for stirrings between Meg and Simon. Which, due to Meg's "not prey" smell actually holds true to the world Anne Bishop has created, and won't lessen Simon a bit even if he falls for her. Let's face it, Meg isn't human, so the rules really don't apply to her. And like I said, there was potential, not that anything happened, and I think that really helped things stay true to the tone of the book. If anything happens, it will be with a solid foundation first. 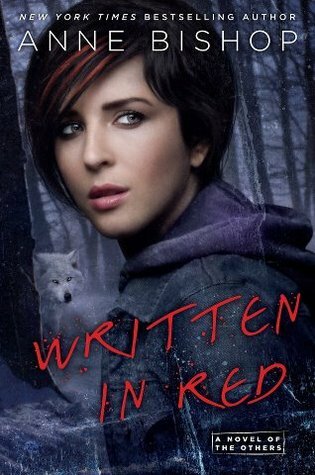 I enjoyed WRITTEN IN RED so much that I'm ashamed to admit that I almost didn't read it. I had received it on my doorstep for review, but the blurb just didn't "grab" me. So since my review pile is pretty large, I put it aside and figured I would get to it if I had time. Then I read an early review from Abigail over at All Things Urban Fantasy that had me instantly excited about it. I picked it up that same night, and wound up being up past 3 am reading it. I paid for it the next day, but it was absolutely worth it. This book is everything an Urban Fantasy should be, and I cannot stress enough just how incredible it is. An absolute delight that deserves to be savored, WRITTEN IN RED is by far the best book I've read all year.